Psychedelic Science 2017 - Peyote Dreams: From Collective Ritual to Personal Treatment? Peyote is a hallucinogenic cactus endemic to the Chihuahuan Desert of northern Mexico and parts of southern Texas, historically used by various indigenous peoples as part of their ritual systems that are intimately tied to their agrarian calendars and lifestyles. The Wixárika or Huichol people are undoubtedly the most well known carriers of these cultural and agrarian traditions anchored to an immemorial use of peyote. Yet, records show that non-indigenous peoples have utilized peyote for its therapeutic properties since the colonial era and particularly since the 1960s boom in alternative medicinal and spiritual practices inspired in indigenous knowledge systems. While peyote can help with arthritis, stomach ailments and scorpion bites (through topical and oral applications), its most promising uses rest in its capacity to treat mental illness and emotional distress such as depression and the death of a loved one. Based on ethnographic research, this presentation explores popular understandings of peyote’s therapeutic benefits that transcend ethnic and spatial worldviews. In addition, I will discuss the challenges that the potentiality of peyote faces due to its scarcity and centrality for some indigenous groups who affirm that its extraction by non-indigenous people could lead to cultural collapse. From the small farmers and migrants who occasionally ingest it in the high plateaus of San Luis Potosí to middle and upper class people who travel from afar to experience its effects, this presentation intends to deepen understandings of the controversy and affect that encircles this mythic plant. 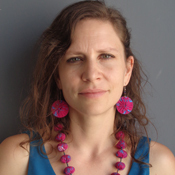 Diana Negrín, Ph.D., is a geographer with a focus on identity, space and social movements in Latin American and the United States. Since 2003 she have conducted ethnographic and archival research in the Mexican states of Jalisco and Nayarit with a primary focus on the intersection between historical and contemporary constructions and contestations of race and citizenship. Negrín's scholarship engages human and cultural geography, critical race theory, cultural studies, environmental studies and urbanism. Her current research examines formations and ruptures within interracial and cross-geographic alliances that surround struggles over indigenous territorial and cultural rights.